I have been working on making a squirrel sliceform for about a week. I have done all I can do. It is close to working, but it is not exactly right. Can someone look at it and see what corrections can be made? Some of the pieces are not perfect because I have had to hack off and add to here and there. I think the little tabs I have attached to the cross pieces are too small. I wish I could help but slice forms befuddle me. I'm sure Crazy Mr Zing will be able to assist tho. I think what you are doing is great. @Meow your squirrel slice form is wonderful. I struggle with the shapes, not to mention slices. Did the sketchup program help you with the body shape or is that just how your mind saw it? Mine end up with lumpy blocks. @Crazy_Mr_Zing thank you so much. I will try to cut it out tonight and put it together and report back tomorrow. I am going to compare the file you attached to the one I attached and see what changes you made so that hopefully I can learn what I did wrong. @Charo I did not use Sketchup for this one. It is just how my mind saw it. 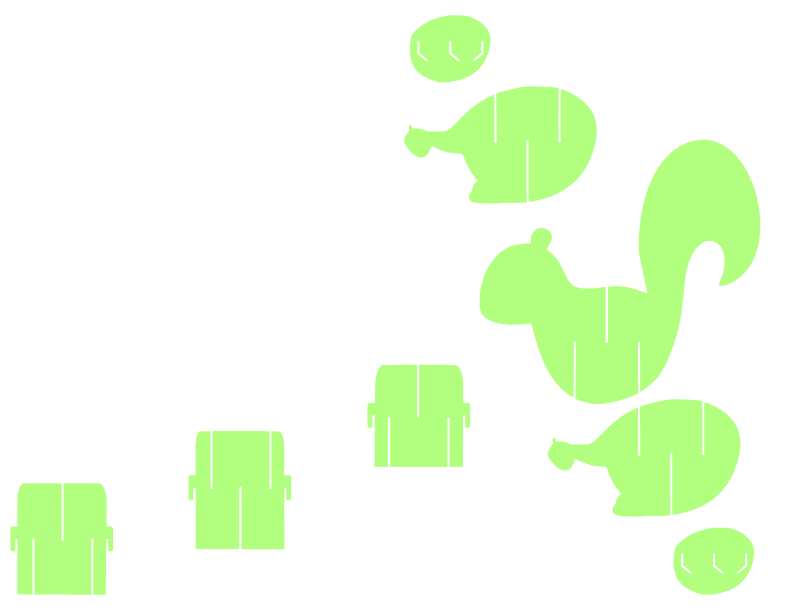 I found a squirrel JPG online and traced it into MTC. Then I node edited and moved the tail a little so that the squirrel would have more of a back on which to put slots. Then I from that main piece I made the other pieces. 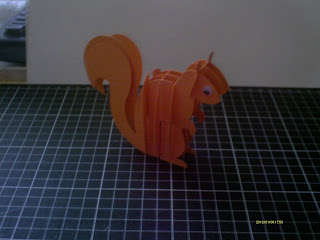 Also, I found one online --not the template but a picture of an actual squirrel sliceform put together. I attached the picture I found googling. I have seriously been praying that God would help me understand sliceforms. I want to so badly. I teach math and physics so I am used to trying to visualize. The problem I was having with this squirrel was mostly the tabs and the slots into which they should go. Also, I had reversed the direction of some of my slots incorrectly. I was at my wits end. Coming here has helped so much and @Crazy_Mr_Zing putting up with all my questions. @Di-lite thank you. I am driving my self batty in the process. @Meow well at least you have a good math background. I don't so much. It just frustrates me to no end that I can see how to put slice forms together if someone else made them. I can even figure out the shapes, although mine are pretty lumpy, but I can never EVER get the slices going the right direction the first several times. I think I should be able to draw it out on paper but I can't... @Crazy Mr. Zing is AWESOME alright. @Crazy_Mr_Zing the sliceform is working well, except that I can't get the outer pieces to attach to the little tabs. It is not a flaw in the design but in my ability to maneuver it When I get one tab in the little slot it comes out before I can get the others in. I think I need to cut it out of sturdier cardstock. @Charo I have trouble seeing how to put any sliceform more than 9 pieces together without instructions. I wish I was better at that. @Crazy_Mr_Zing I think I am going to try adding a little to the top of the tabs, but it also occurred to me to put those pieces on first and then try to maneuver the other ones one. Thank you so much for the help you give on these sliceforms. @Meow I cut your cute little squirrel yesterday and also had difficulty with the last piece. And I enlarged your file 50% too. Finally I lined up the little piece with the center tab, got it in and much to my surprise one of the sides fell into place. Then I was able to tweezer in the last one. But I don't think it would have been possible if I hadn't enlarged the pieces first. I never understood those little keyhole things but now I see they help in locking the piece in place. @Charo ; I am happy to hear that it is possible. I am going to try to add a little to the top of the tabs so that they will be more secure when placed in the slot. Then I am going to put them on first and see if I can maneuver the other pieces in place. @Charo ; when you enlarged the file by 50%, did you have to redo the width of the slots? I've never put much thought in to which what the keys are, maybe the would work better the other way up?? @Meow I did not have to change the slot width after enlarging. A nice surprise. @Charo thanks. After 6 tries I finally got mine put together.